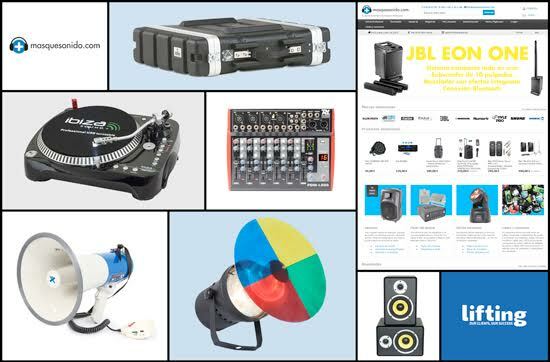 Masquesonido is an online electronic products shop centered around professional lighting and sound. On its website you will find the principal professional electronic brands on the market and will be surprised to discover its extensive catalog of products with more than 5,400 online references. This level of expertise, coupled with the constant work and effort of the Masquesonido marketing team has enabled the brand to establish itself as one of the main references in the online sales of electronic products sector. Lifting Group has worked with Masquesonido management and marketing to help consolidate its business objectives, focusing on a strategy to achieve growth and fame online. Having a team of consultants specializing in the online medium has enabled the firm to stand out from their competitors and achieve very good results; both in terms of business performance and growth. Through running a powerful digital strategy, focused on working positioning and visibility through the SEO, both external and internal, it has succeeded in maximizing visits to the Masquesonido website. All of this, combined with the implementation of different Adwords campaigns (display, remarketing and shopping) has substantially improved the online output of the brand, managing to triple its income, thanks to the exponential growth in sales. Consultancy and strategy for optimization of sales strategy in online channels. The generation of a strategy of brand visibility and fame through digital strategy. Defining an organic positioning strategy through online channels. Optimizing online marketing campaigns in Google Adwords. Business growth and exponential increase of growth figures and invoices of Masquesonido online channels. Organic SEO increase of more than 40%. Reduction in conversion cost of more than 340%. Continued increase in the brand’s visibility, thanks to collaborations with websites in the electronic sector. Increase in the authority of the brand thanks to better positioning and indexing of key strategic words.